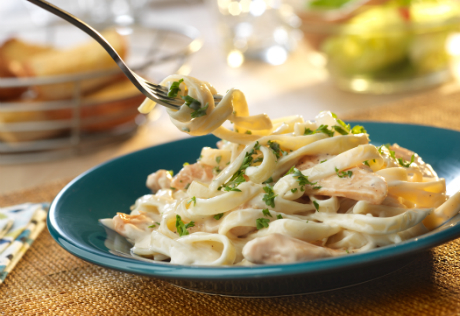 Our Chicken Alfredo recipe is a family favorite that's on the table in just 35 minutes. Seasoned, sautéed boneless chicken breast strips and fettuccine are bathed in a savory garlic and Parmesan Alfredo sauce. The result is a mouth-watering dish that can’t be beat! Cook and drain the fettuccine according to the package directions. While the fettuccine is cooking, season the chicken as desired. Heat 1 tablespoon oil in a 12-inch skillet over medium-high heat. Add the chicken and cook until browned and cooked through, stirring occasionally. Remove the chicken from the skillet, cover and keep warm. Reduce the heat to medium. Heat the remaining 1 tablespoon oil in the skillet. Add garlic and cook for 1 minute, stirring often. Stir in the sauce and heat through. Return the chicken to the skillet. Add the cooked fettuccine and toss to coat. Season to taste. TURN LEFTOVERS INTO A GOURMET MEAL. Ziti, sauteed beef and onion, Prego® sauce, and mozzarella and Parmesan cheeses are combined to bake and serve now or freeze and serve later.